Everyone has their own way of getting away from the daily grind. Some relax by listening to music. Others may lose themselves in a movie or hit the gym. For a trio of GCU staffers, they hit the road — or sometimes trails — on their bikes. As you will see, we’re not talking about the occasional jaunt around the neighborhood. The three are Dr. Brian McGuire, executive director for the Office of Institutional Research; Head Athletic Trainer Geordie Hackett; and Enrollment Counselor Lance Hinderleider. 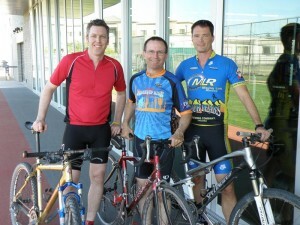 They’re competitive cyclists, and two of the three have major events coming up. On Saturday, McGuire will participate in the Los Angeles Wheelmen Grand Tour, a 200- mile, one-day ride with an elevation climb of about 5,000 feet. He will start in Malibu, Calif., and ride along the coast toward Santa Barbara. He’s using the ride as a stepping stone for his ultimate goal, the 200-mile Death Valley Double Century, which has a 9,000-foot elevation gain and is held in October. “I’ve never done a Double Century before,” McGuire says. Also on Saturday, Hackett will ride in the Williams Warp, an MBAA Series Championship race in Williams, Ariz. It’s the final race in a series of eight, and if he can improve his state ranking to third, he will qualify for the national championship event. (l to r) Lance Hinderleider, Brian McGuire and Geordie Hackett. McGuire isn’t sure what made him decide to start riding. All he knows is that once he started, there was no stopping. When he’s not at work crunching numbers for GCU, he can be found riding the streets and canals on his bike. He usually rides between 30 and 50 miles a day by himself on weekdays. He does it, he says, because he likes the feel of the wind, seeing the sights and the escape it brings. On the weekends, McGuire will ride between 50 and 100 miles with a group out of north Phoenix. The cyclists ride in two lines, with the leaders looping out and to the back when they get tired, allowing the next in line to take over. Hackett is a mountain biker who played soccer in college and on an amateur team throughout graduate school. During a summer break, he decided to cross-train by biking. He got tired of riding along the canals by his house, so he moved into the mountains. Within a month, he was competing in races. Hackett races with Missing Link Racing, which participates in the Mountain Bike Association of Arizona, an advocacy group dedicated to racing ,riding, and trail building and maintenance throughout the state. Hackett’s team is currently ranked seventh in the state, and he is ranked fourth individually. With a family and a full-time job, he isn’t able to train as hard as he would like. That’s where his athletic training and certifications come into play. Using his knowledge of the body, he’s able to maximize the training he does, for optimum results. Hinderleider has been riding a bike in some form since he was 13, when his father bought him his first ten-speed. At first, cycling was simply transportation for him. While attending at Arizona State University, he would ride from Tempe and to his parents’ house in north Phoenix. After graduation, he rode much less until a friend sold him a used road bike. He was hooked. He joined the Arizona Bike Club and started riding with the club every weekend. Eventually, he bought a new bike. The three men have formed an unofficial GCU cycling club, participating in rides together such as the MS 150, a two-day, 150-mile ride to benefit the National Multiple Sclerosis Society, and the Tour de Cure, which benefits the American Diabetes Association. McGuire says there are other cyclists among the faculty and staff at GCU, and the goal is to get something official started. Hinderleider leaves on Thursday for Alaska. Although he won’t be part of an organized event, he’ll be visiting his brother — also a mountain biker.